Quite often I run some job on the command line that takes a few minutes. Staring at the terminal waiting for the job to finish is not fun. Switching to check what's on Facebook I end up wasting an hour looking at pictures of cats and dogs. If I am lucky. I am trying something new now. I'm trying to send myself an alert whenever a task is done. For this to work first I had to find a way to send a notification from the command line. AppleScript is a scripting language created by Apple. It has a bunch of commands. There are a couple of interesting ones, for example: display and say. The display command can send a notification to the standard notification system of Mac that will show a pop-up for a few seconds and that can be listed by clicking on the hamburger icon in the top-right corner of the screen (at the right end of the menu bar). We could write an AppleScript in a file and use osascript to run the file, but osascript can also execute one-liners where all the commands are on the command-line. That seems to be more useful at this point. In order to run it on the command line we need to wrap that code in single-quotes and use the -e flag of osascript. 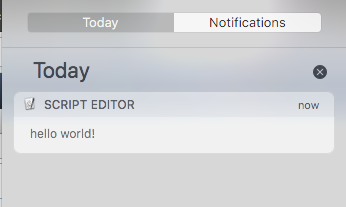 You can clear the list of notifications by clicking on the x.
display notification "hello world!" 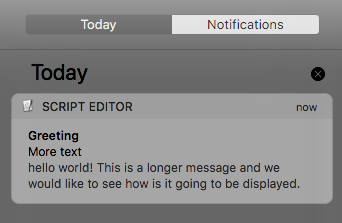 with title "This is the title"
display notification "hello world!" with title "Greeting" subtitle "More text"
In addition to the visual notification, the display command can also include a sound effect. The sound can be one of the files in /System/Library/Sounds or in ~/Library/Sounds. display notification "hello world!" with title "Greeting" subtitle "More text" sound name "Submarine"
If the name of the sound is incorrect Mac will make an alert sound. There is another way to create a notification using the display alert command. 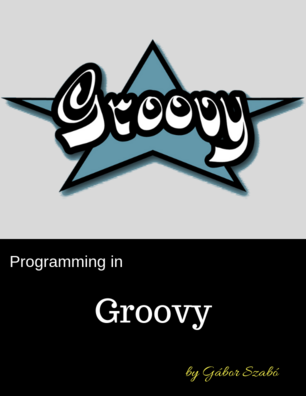 The syntax is a bit different. The string that comes immediately after the display alert is the title and then one can optionally add a message parameter with a longer explanation. display alert "Hello World!" message "longer text can be added in the message field and it will be all shown on the pop-up alert." The result is a pop-up window in the middle of the screen that also stays there till you click on the OK button. The alert won't be recorded in the notification center of your Mac. 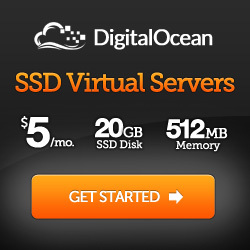 Finally there is also the say command that can vocalize any text you give to it. This does not have any visual effect, but it is quite surprising when your computer starts to talk to you. The whole article was written because I wanted to get some alert after a long-running program ends. Here we substitute the long-running program with sleep 2. We can then include a call to osascript or even two calls to osascript to be executed immediately after the main command (the sleep 2) ends. I put in two ways of notification so I'll hear some text if I am near the computer but does not watch the screen and I'll get a pop-up that remains on the screen later. So even if I am out of the room when the process ends, I'll see the pop-up when I return to my computer.